Disappointing that there are no plans to change that congested nightmare of a skyway corridor. It's congested because people like the businesses that are there. This seems like a good thing. The distinction seems to be that Class A is brand new, while Class B isn't. You can renovate a Class B space to the point that it's Class A caliber, but the fact that it's not new construction is where they draw the line. The Dayton's building will always be plagued by deep floorplates with poor access to windows for most of the users. No amount of updates will change that, and so I don't think it will ever be true Class A space. That doesn't mean it won't be attractive for the right user. The offices in the Dayton's building were miserable. As you said, not a lot of windows, but they were also borken up really poorly, low ceilings, really dated furniture and carpet, and poor quality at that. Gutting it an starting over will help some, but will need some creativity to make it appealing. Wells Fargo is delaying bringing this development to the Elliott Park land-use committee tomorrow. So we will have to wait for more details. The parking lot at third and Chicago, which I thought I read at some point was owned by the Wilf's, is closed and blocked off at the moment. Is something going in there? That block is split into three parcels, one owned by the Met Council and the other two are LLC's with NJ addresses that presumably belong to the Wilfs. I couldn't find any info about pending development there though. Could this just be for tonight? It's the Taste of the Vikings event at USBS. Did they close this lot on game days? Is that this site: http://www.sherman-associates.com/Stadi ... rant-Site/ ? South of that, across 3rd. Update: the parked cars are back. False alarm. This may be the last photo you see from this angle. They demolish the bridge tomorrow and the new bridge is 20 feet lower. This spot shows off where the new 12st Street residential tower will be. They demolish the bridge tomorrow and the new bridge is 20 feet lower. 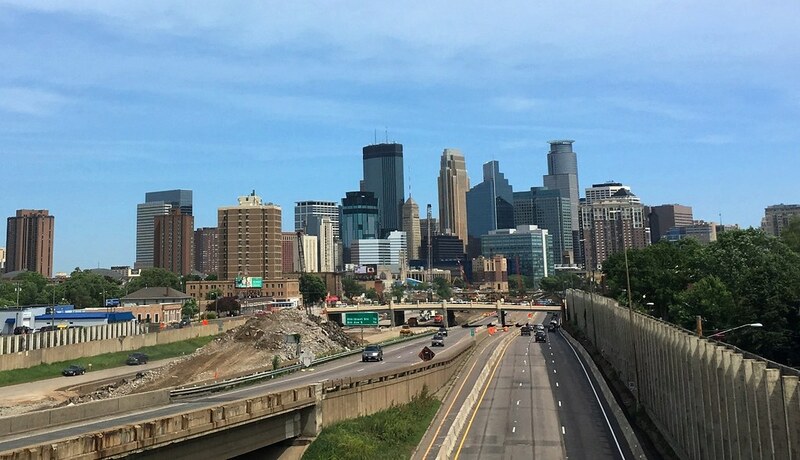 Will the 12th street residential tower cover the Foshay from this view? That’s a good question because with that raised ramp going southbound on I35 I could not see how they could lower that pedestrian bridge 20 feet and not get too close. Hmm. The visualization MNDOT posted on YouTube shows SB 35W going under the downtown lanes, which is what I had originally typed before digging up that PDF and changing it to "over". Under makes way more sense anyway. I think you were right the first time. The drawing to me looks like 35W southbound does indeed pass under the downtown lanes.